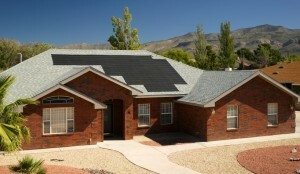 It might be time to take a second look at integrated solar roofing systems. Updated: A version of this post originally ran in June 2015. Ah summertime, when the livin’ is easy. It seems like nothing can get you down except for maybe one thing – spiked electric bills. This summer, let’s beat the heat. See how you can help your family maximize fun without stressing your wallet. Smart investments can help manage expenses in the summer, and for seasons to come. Achieve summer solace with an integrated solar roofing system. It’s an innovative, energy-efficient choice, and can generate most or all of the electricity a home uses during the day. In newer systems, unused power is transferred back to the power grid, which can reduce electric bills even further, and won’t compromise curb appeal. Curious if solar is right for your home? Take our solar quiz. 2. Leave the lights off as long as possible. My favorite features of summer are the long days and natural light. I love being greeted by sunlight in the morning so much, that I often find additional lighting unnecessary. I have discovered that switching out my incandescent light bulbs with compact fluorescent or LED bulbs decreases unwanted heat in the home and will save you money at the same time. Grilling out isn’t just a great way to enjoy a meal. It’s good for your energy bill too. Whenever possible, get outdoors! Another great way to prevent rising temperatures in the home is to avoid using electrical appliances such as ovens. 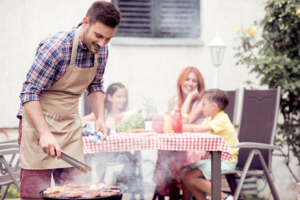 Instead grill outside; it’ll help reduce energy use. Sometimes you need to cool off, and that’s when air conditioners can come in handy. When possible, use the AC sparingly, and never cool a vacant or unused room. I am a huge supporter of fans – ceiling or portable. Both create a healthy breeze and consume far less energy. If you find fans can’t seem to keep your family comfortable, there may be a larger opportunity to find a sustainable solution. It might be time to add insulation to your attic or walls. Adequate insulation not only keeps your house warm, it can keep it cool, too. Insulated siding and housewrap can have the same effect. Combined, these products can help reduce energy bills and improve energy efficiency – making summer even sweeter. Have questions about improving the energy efficiency in your home? We can help you better understand your options. Plus, if you’re worried about the efficiency, noise, or moisture levels in your home insulation can help. So should you add more? We walk you through the decision making process. These are some great ideas for anyone looking to go “green.” Some of our kitchen and bathroom remodeler projects involve energy efficiency updates for a variety of reasons. Some care about the environment and others are looking to save money. Of course, everyone is benefiting from both.